The B612 Foundation hopes to neutralize the asteroid threat. Forty minutes east of Flagstaff, Arizona, just south of I-40, the desert plain gives no hint of what lies ahead. Then the sudden break in topography comes into focus: a weathered plateau, where 50,000 years ago a nickel-iron meteorite half the size of a football field slammed into the ground at 26,000 mph. The meteorite blasted a crater as deep as the Washington Monument is tall—550 feet—and three-quarters of a mile across, with the force of more than 20 megatons of TNT. Hurricane-force winds ripped across the plain for 20 miles in all directions. This is the kind of event that Ed Lu thinks about often. A retired NASA astronaut who spent six months aboard the International Space Station in 2003, Lu is the co-founder and CEO of the B612 Foundation, named for the asteroid in Antoine de Saint-Exupéry’s 1943 story, The Little Prince. The non-profit foundation is now focused on an extraordinary mission: raising about $400 million in private philanthropy to build, launch, and operate an infrared space telescope for finding Earth-threatening asteroids. (Asteroids are rocky objects, smaller than planets, orbiting the sun; meteorites are asteroids that have survived passing through the Earth’s atmosphere and hit the ground.) The mission, expected to launch late in 2017 or early 2018, is called Sentinel. “If you really sit here and think about what is the most important thing I could be doing, I think this is it,” says Lu, who left NASA in 2007 and joined Google to lead teams that developed imaging technology for products like Google Earth. In addition to leading the foundation, he also works as chief of innovative applications for Liquid Robotics, an ocean data services company in Silicon Valley. “It’s not that this is something that ...we need to mobilize everybody for. You don’t,” Lu says. “We are talking about building the wing of an art museum.” That analogy is something the leadership at B612 uses often. No one at the foundation underestimates the challenge of raising close to half a billion dollars. But Lu seized on the idea after giving a talk in 2011 at Google about how humans might be able to deflect an asteroid on a collision course with Earth—B612’s focus for more than a decade. Plans to protect the planet, however, are useful only if scientists know where those asteroids are and where they’re headed. Lu argued that this kind of large-scale identification and tracking required a space telescope dedicated to searching for asteroids whose orbits approach Earth, known as Near Earth Objects, or NEOs. “One of the guys there raised his hand and said, ‘Why don’t you just do that?’ ” Lu recalls. He gave what he thought was the obvious answer: money, as much as a few hundred million dollars. The attendee replied that he’d just donated to the Museum of Modern Art in San Francisco, which was then raising around $400 million to build a new wing, and that no one involved in that project seemed to think this level of fundraising was an insurmountable task. Lu consulted with people experienced in philanthropic capital campaigns—from museum executives to university administrators to the people who raised funds for the Keck telescopes in Hawaii—and it put the task of raising money for a space telescope in perspective. The plan is to put Sentinel in an orbit near that of Venus for its six-and-a-half-year mission. From there, the telescope can scan for NEOs, looking out toward Earth and beyond, focusing on a range roughly between 0.7 and 1.3 astronomical units (1 AU is the distance between Earth and the sun, about 93 million miles). In a 2007 report, NASA wrote: “Observatories located in a Venus-like orbit are the most efficient at finding NEOs inside Earth’s orbit, a population which has the most uncertainty yet still poses a hazard due to gravitational orbit perturbations [deviations in orbit].” Gareth Williams, associate director at the Minor Planet Center at the Smithsonian Astrophysical Observatory in Massachusetts, a clearinghouse for asteroid discoveries, says that there are an estimated 14,000 NEOs larger than 460 feet. An asteroid this size could hit the planet with the force of more than 27,000 Hiroshima-class bombs, and only a third of them have been found and tracked. When it comes to a smaller but still dangerous category of NEOs—those larger than 100 feet—there could be more than 300,000 orbiting nearby, and only about one percent have been tracked. It was something from this smaller-size group that scientists believe exploded above Tunguska, Siberia, in 1908 with the force of about 1,000 Hiroshima-class bombs. Sentinel’s goal, to identify 90 percent of NEOs larger than 460 feet in diameter, comes from the 2005 NASA Authorization Act, in which Congress ordered the agency to expand its survey, which was then focused on NEOs one kilometer (0.6 mile) and larger—the size that could cause global extinction. NASA balked, issuing that 2007 report that evaluated expansions to the program, including a dedicated infrared space telescope to find the smaller asteroids. The agency concluded that Congress had not approved enough funds to expand the program. That’s where B612 wants to step in. In addition to its primary mission, Sentinel is expected to detect many of the smaller Tunguska-size asteroids. “Our goal is to find as many of the dangerous asteroids as possible,” Lu says. If an asteroid on a collision course with Earth is found and tracked early enough, it might be possible to launch a mission to deflect the object. 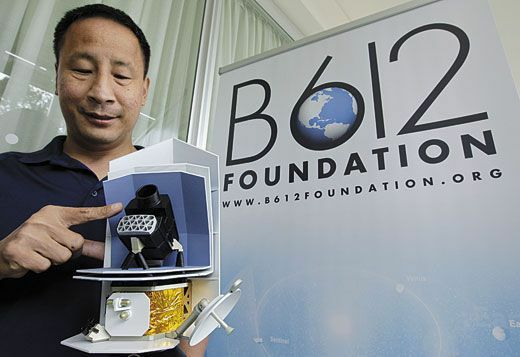 In 2002, when B612 was co-founded by Lu, Apollo 9 astronaut Rusty Schweickart, Princeton University astrophysicist Piet Hut, and asteroid expert Clark Chapman from the Southwest Research Institute in Boulder, Colorado, it was to pursue ideas for a deflection mission. 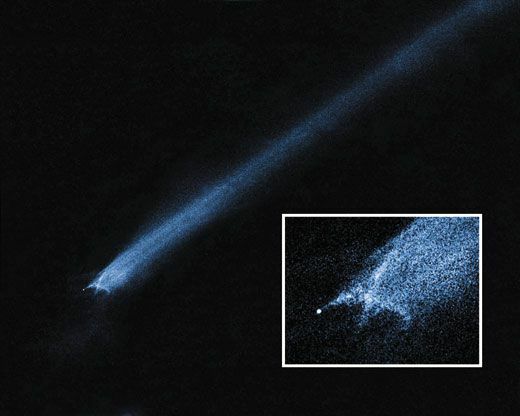 Among them is the “gravity tractor” maneuver, where a spacecraft hovers near the asteroid, and over the course of several years or more, its relatively tiny gravitational field nudges the asteroid just enough to move its trajectory off a collision course with Earth. B612 assumed that NASA would eventually get a handle on identifying the potential NEO threats. There are some ground-based projects, such as the University of Hawaii’s Panoramic Survey Telescope and Rapid Response System—Pan-STARRS—and small-telescope networks like the Catalina Sky Survey (see “Pint-Size Sky Watchers,” Oct./Nov. 2012), whose primary goals are to search for NEOs. Once the B612 leadership decided to build Sentinel, things started to move quickly. The foundation assembled a team of engineers and administrators, among them Reitsema; project architect Scott Hubbard, former director of NASA’s Ames Research Center; and Tom Gavin, former associate director for flight projects and mission success at the Jet Propulsion Laboratory in California. Ball, which has extensive experience working on the Hubble, Spitzer, and Kepler space telescopes, as well as the Deep Impact mission to comet Tempel 1 in 2005, has bid a fixed-price contract for the development of Sentinel and is currently negotiating the details, including cost, with B612. Unlike negotiating an arrangement with NASA, working for a private foundation frees Ball from many of the regulatory and accounting rules imposed on taxpayer-funded space projects. The result will save B612 up to 30 percent, Hubbard says. That’s how B612 can keep the total cost of the mission, including plans to launch aboard SpaceX’s Falcon 9 rocket, to something in the neighborhood of $400 million, he adds. John Troeltzsch, Ball’s designated program manager for Sentinel, has also worked for the company on Hubble, Spitzer, Kepler, and Deep Impact. Sentinel will need a deep space communications system like Deep Impact, a wide field of view and onboard processing power (so it doesn’t waste bandwidth sending data on known asteroids) like Kepler, and infrared detector systems like Spitzer. Keeping Sentinel’s detectors adequately cold will be a challenge, particularly because the spacecraft will be much closer to the sun than other space telescopes. Unlike Spitzer, which relied on a large tank of liquid helium coolant, Sentinel will use a cryocooler—a mechanical refrigeration device—to keep its detectors cold and free from thermal interference. Imagine a much more elaborate version of the compressor underneath your refrigerator. “[Sentinel is] working off of a lot of technology that the government did pay for…and we’re putting these pieces together in a very unconventional way for an unconventional customer to do something really cool,” says Troeltzsch. Still, the mission is not completely independent of NASA. In June, the foundation signed an agreement that will allow Sentinel to use the Deep Space Network for data transmission. NASA is also offering staff to help B612 review Ball’s work, and once Sentinel is flying, the agency will devote resources for analyzing data and assessing asteroids tagged as potential threats at its Near Earth Object Program at JPL, Lu says. That leaves the money. The foundation announced its fundraising drive for Sentinel last June at the California Academy of Sciences in San Francisco. The strategy for raising money is broad, like other philanthropic capital campaigns, Lu says. Potential donors large and small are being wooed at science meetings, at special dinners, and in private appointments. 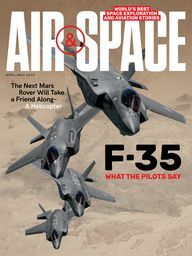 He adds that B612 is looking for sponsors, akin to Red Bull’s sponsorship of Felix Baumgartner’s skydive from the upper atmosphere in October (see “Bullet Man,” June/July 2012). And like any good modern fundraiser, the foundation’s Web site has a donate button that lets supporters give as little as 10 dollars. Lu’s fundraising tour over the next year will take him across the United States and throughout Europe and Asia. 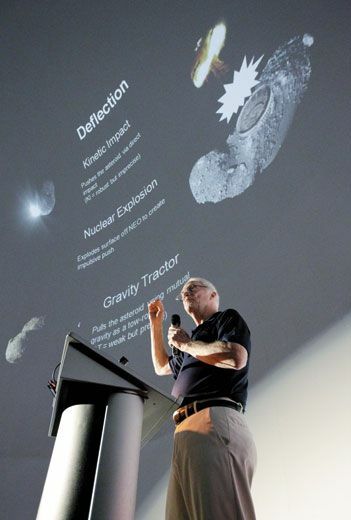 The foundation has treated its biggest potential donors to guided field trips to Meteor Crater in Arizona, “to see in person the incredible kinetic energy released in even a tiny asteroid impact,” Lu says. But B612, unlike ventures like Planetary Resources, which aims to mine asteroids for commercial gain, is focused solely on existential threats, Lu says. Few people can appreciate the destructive power of asteroids like astronauts, who have seen with their own eyes the vulnerability of Earth from space.